Olerom helps owners, top managers of companies to enhance the efficiency of business. Olerom specialization is to organize and conduct open, corporate training, seminars, business consulting. Do you need business experience from the best specialists in the area of growth strategy, tax planning and optimiza17tion, asset protection, strategic management, business planning, and more? We will prepare for you a seminar, a master class, a training workshop that will help you achieve the best results. Or maybe you want to improve yourself, to answer your critical questions, better understand yourself, learn to understand and recognize other people, learn secrets of conversations or negotiations, become a successful person, leader, head and organizer of your own business? We can gladly provide you with assistance in the implementation of such a responsible and necessary step in your formation and professional development. 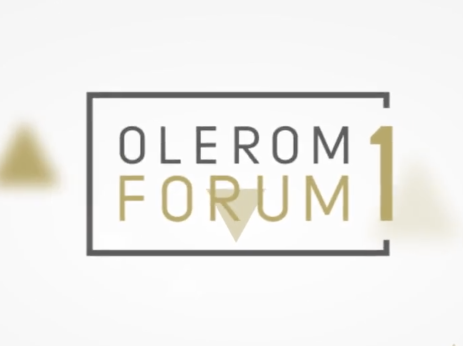 Olerom, together with you, dear customers, is on the way of constant development, follows new trends and developments, monitors the relevant information, and works with reliable trainers and experts. Only in this way will we be able to jointly solve the current problems and tasks and confidently move forward in a successful future. The 24th news channel is the first Ukrainian round-the-clock news channel.The official date of the beginning of the history of the TV channel is March 1, 2006 - the very first round-the-clock air was held on this day. On the Fund's concept: The Blagomai Charitable Foundation is engaged in changing people's awareness of the implementation of good deeds, helping to do good deeds correctly, creating opportunities to do good deeds and instilling the habit of doing good deeds. Ukraine has always been associated with the world’s breadbasket but now besides having a strong agricultural sector Ukraine has a chance to become a “brainbasket” by exporting results of intellectual activity of our IT professionals. BrainTV is an Internet TV project of BrainBasket Foundation. It's a TV channel about tech in Ukraine has been launched on April 2016. The broadcasting includes tech courses, analytical reports and live talk shows. The team includes 7 professionalists. The first BUSINESS Magazine came out in December 1992 under the direction of Sergei Melnichuk, a businessman who developed the concept of the publication. Dsnews is a resource for people who want to keep abreast of the latest developments, but do not want to waste time watching multiple news feeds. The "The Wheel of Life" magazine is a magazine of fresh, bright and creative people. This magazine is from those and for those who are passionate about themselves, the world around, who is ready to win and enjoy their victory. And we are all winners - we live! Right now, this second. "Radio Kyiv - 98 FM" - the first city official radio station.Beginning of the broadcast: March 29, 2004. Nimses is a worldwide system which records and saves the time of a human being’s life. After the user registers an account with Nimses, each minute of the person’s life turns into a single Nim, a unique and indestructible unit of digital currency. "Observer" - an online publication, founded in 2001. We occupy first place in the daily traffic among Internet media in Ukraine. Oxy Taxi is the first electric car taxi service in Kyiv, including the standard Nissan Leaf and the premium Tesla S 90D. Find new possibilities for you on rabota.ua. One of the biggest online-sources on work research in Ukraine. SmartPress is a project of the company "AS-Media", which since August 2008 operates in the Ukrainian market in the form of a full-service subscription agency. Hit FM Radio Station is the largest radio network in UkraineCovering 86% of the territory of Ukraine! More than 100 cities!More than 3 million listeners every day! Olerom helps owners, top executives of companies improve business efficiency. Oleer's specialization is to organize and conduct open, corporate training, seminars, business consulting.